Indoor soccer is plenty of fun to play on the field, but not so much pre-game, particularly the part where you have to choose the shoes. From soccer cleats to boots and shoes, there are too many variations of it that might confuse a rookie, and even seasoned players. Our guide will walk you through the ins and outs of indoor soccer shoes, to distinguish its specific characteristics and recommend what the market promotes as the best. 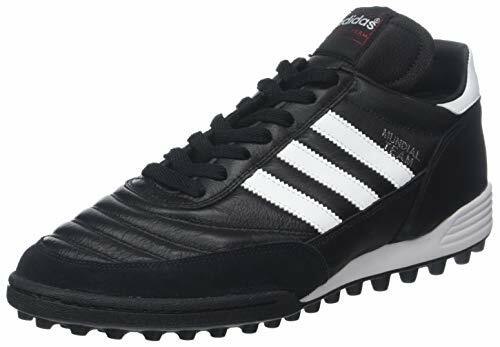 Out of the 7 shoes we reviewed, there were 3 that we classified as the best indoor turf soccer shoes: Adidas Copa Tango 18.1, Adidas Performance Mundial Team, and Adidas Performance Samba Millenium. It was a tough decision to narrow it down to the top soccer indoor shoes overall, but in the end, the Samba Millenium was the favorite. Along with being compatible with soccer players of different levels and ages, the Adidas Performance Samba Millennium provides you with an exceptional grip on indoor fields. This pair of shoes gets our vote for the best indoor soccer shoes. If you’re looking for indoor shoes for soccer that will last you for a long time, here is our list of the top rated indoor turf soccer shoes on the market. You will find our top three picks here, and if you read further in this guide, we have a comprehensive review of each shoe. You may reckon that trying to learn indoor soccer is easier than choosing the right shoes for it. The variety of features that determine what’s good or not can be overwhelming and confusing. The material is almost never missing in the description of indoor soccer shoes and it’s one to never ignore. It can affect a lot of things like the shoes’ weight, performance, functionality, and compatibility with the player. It makes up a large part of the shoes’ composition, especially in the upper or the vamp where the foot touches the ball. Though there’s the rising popularity of textile, particularly woven knit, they’re commonly made with leather or synthetic, and each comes with their own pros and cons. Since synthetic is man-made with inorganic raw materials, it can be manipulated more in terms of technology and design. Manufacturers are able to create shoes without as much limitations as when working with an already existing material like authentic leather. Simultaneously, the material is able to persist with the color and design barely faded or damaged. External conditions and internal factors also don’t affect the shoes much. This means wet weather or your own feet won’t damage or change the shape and structure of the shoes. These are why some of the positive attributes of synthetic soccer shoes include strength, durability, and water resistance, thus making it more convenient and long-lasting. They can also be disadvantages if the break-in period, comfortability, and ball touch are big matters of importance to you. It takes a while for the shoes to feel as if they’re formed to your feet’s shape. Compared to leather, synthetic is also thicker and heavier, making it harder to establish a stable connection with your feet and the ball when kicking. Depending on your position on the field, this material has different advantages and disadvantages to different players. On a more universal note, they’re less expensive than authentic material, so it’s a good beginner shoe for people trying out the sport or casual players. Leather is generally thinner than synthetic but within its own realm, one kind of leather is thinner than others. You’ll see some of the most expensive indoor soccer shoes are made of kangaroo leather. The high price is usually justified by the material’s good properties. In the process of turning raw leathers into shoes, they’re thinned down. Kangaroo leather is the one whose quality and strength isn’t affected by this procedure. Its fibers follow a uniform direction, which works well for the manufacture and design of the shoes. The thinned down material cuts down on the weight too. Indoor soccer shoes made with kangaroo leather may be more expensive but they’re lightweight yet sturdy. That’s a good exchange in our book! Thick leather refers to different types of leather other than kangaroo. Calfskin, cattleskin, suede, and full grain leathers are some examples in this category for indoor soccer shoes. Unlike the previous one, they require some level of thickness to achieve the same kind of strength. The fibers are not uniform in direction and some are even positioned away or at 90-degree angles to each other. Nonetheless, it still carries the positive qualities of authentic leather as compared to synthetic. Leather soccer shoes are said to be more comfortable to the feet. There’s usually no break-in period as the material molds to the specific shape of your feet, being softer than synthetic. The stretchiness can be a disadvantage in the long run, but it’s more desirable if you need a good ball touch as the thinner material connects to the ball as if you’re barefoot. Generally, the weight of indoor soccer shoes are in the range of 9 to 12 oz. At least that’s applicable to the existing shoes in the market right now. Even the shoes we’ve just reviewed fit into that measurement with only one or two exceptions that go below or exceed those numbers. There are many factors that determine weight, the material being a major contributor. Synthetic is heavier than leather, but advanced technology are employed to create lighter versions. Lightweight is fast becoming a trend. However, it doesn’t always dictate the effectivity of the shoes. It depends on your position and the type of player you are – your strengths and weaknesses. Heaviness can have its advantages too: it helps with maneuverability, balance, and enhances traction. For other types of sports shoes, an allowance or an extra inch on the toes might be preferable. We can’t say the same for indoor soccer shoes. Instead of a full inch, you’ll want just an eighth or a quarter of space in the toe, while snug at the back to prevent chafing and blistering. Indoor soccer shoes are meant to be snug and tight but not suffocating for the feet. If it has to be broken in, you have to consider that there might be a chance for it not to mold to your feet as desired. Adult soccer shoes also tend to differ for men and women, and for those with wider feet. Make sure to check if the model applies to the type of foot you have and if they carry your proper size. Trying to fit into a pair that’s not meant for you might fail, no matter the stretchability of the shoes. In a brief recap, the parts of an indoor soccer shoe consists of the upper or vamp, outsole, insole, midsole or the cushioning, heel counter, and studs or cleats, though these are optional. The material on the upper, either synthetic or leather, are usually the same for the rest of the exterior of the shoes. For decoration, some other materials like suede or mesh may also be incorporated. Based on what’s often used by big brands and what has been positively remarked by players and customers, the best material for the outsole is gum-rubber and EVA cushioning for the insole, midsole, and heel counter. The protruding studs or cleats at the bottom of soccer shoes are not much of a significant requirement in the game of indoor soccer. However, if you ever choose one with them, make sure it’s for turf surfaces as indoor fields usually use artificial grass. Grip is important for both the upper and bottom sides of indoor soccer shoes. For the sole, grip can mean the same as traction, which is important for running. Gum-rubber soles are suitable for court and even street surfaces, whereas cleats aid you on turf surfaces. On the other hand, grip on the upper is crucial because it’s the actual quality that drives you to score. Grip for the upper affects your ability to kick the ball to the right direction and with the right force. In this aspect, the thinner leather material might be more beneficial. Flexibility is just the same as the stretchability of the shoes. Some shoes make room for a better fit the more you use it while others stay in their initial structure. As we’ve established, between synthetic and leather, the latter is more able to mold and adapt to your feet’s shape. If you have asymmetrical feet, or just don’t have much patience and willingness to go through the breaking-in process of shoes, leather is superior in this particular feature. We’ve distinguished the importance of the sole for the player, which is its ability to provide traction. However, your choice of outsole for indoor soccer shoes can also be affected by the type of surface you’re going to play on. From every type of sole there is, we determine where they’re appropriate for. Starting with the most common type of outsole, gum-rubber is often used for their non-marking qualities. Gum-rubber don’t come down on surfaces too much, causing them to leave no marks that may damage the floors. This is preferred for polished courts where there’s a greater need for maintenance. Unlike gum-rubber, solid rubber might be too harsh for indoor fields like turf and courts. The intensity of the game may destroy the artificial grass blades and the mat of turf, and leave marks on flat floors that will eventually lead to bigger damage. This type of outsole may be usable only on the casual street games or for casual wear. Cleats are the safest choice as the best soccer shoes for indoor turf. It’s usually the default surface of indoor soccer fields. So while, the low rubber studs serve the player well in terms of traction, it also doesn’t destroy the artificial turf no matter the force put down upon every step. Soccer shoes may not be fashionable in the traditional sense, but they have their own sense of style that only belongs on the field. These are just some of the things you might want to look into if you’re not familiar with what’s good or not for such a specific type of shoes. The design aspect takes some notes from other features. Extra materials can be added onto the exterior, either for pure superficial appeal or doubled up with functionality. Mesh panels and suede toe caps are among the most common additions, both for breathability and added grip. Not all soccer shoes will look appealing on everyone. Some are bulkier than others, and depending on the type of feet you have, you might want to consider their overall look, especially when worn together with your uniform. As with our top picks of indoor soccer shoes, there are plain ones and colorful ones. The plain and neutral – mostly black – ones are good for their timeless and versatile appeal. However, colorful cleats have always been a welcome sight on the field, especially when they’re aesthetically matched with the teams’ colors and uniforms. We’re willing to bet that purchases of the Adidas Performance Messi 16.3 TF are mostly by supporters of the famed player. It’s not a foreign concept for fans to collect every merchandise with their favorite’s name attached on it. It’s the same for other sports like basketball, and in this case, soccer too. You might think the most professional-looking cleats will immediately be the best among the bunch. Maybe it’s the brand or the appearance, but each model boasts of its own features that might not necessarily be beneficial to you. These recommendations are seven of the best soccer indoor shoes, and we’ll tell you why. Adidas claimed it first. As you’ll see it described on their website, the adidas Copa Tango 18.1 Trainer Soccer Shoes is “honed for the maestro.” Even the brand would probably pronounce this model as one of the best Adidas indoor soccer shoes. It’s made for soccer players whose passion for the game is comparable to that of an artist towards his craft. Since that is the market, Adidas matched it with very reliable features found in this first pair. The Copa in itself has held a legacy and evolved with the times to show what a modern classic looks like in almost every era. There’s a naming system that Adidas follows when naming their shoes and 18 is the highest number that classifies their pairs based on quality. Copa Tango 18.1 obviously holds one of the highest classifications, so it’s like the brand’s recommending it directly. Copa shoes has been loved by generation after generation of soccer players – and for good reason. We only expect this specific model to follow suit. Without looking at the shoes, any player would notice its snug feel immediately as they’re designed to fit like a sock. This could be attributed to the quality of compression built into the interior. The fold-over tongue has a two-way purpose that contributes to the optimal fit and allows ease of wearing. Going from the inside out, it’s irresistible to start with the EVA insole and Boost midsole. EVA is a common material you’ll see in most soccer shoes. The Boost technology of the midsole, however, is an Adidas-specific feature that boasts of comfort and responsiveness. It’s a certain cushion that gives back whatever energy you exert, thus the term responsive. The force of your steps will be countered by the foam heel pads, boosting you into a faster run rather than holding you down to the ground. It’s also shaped with an average arch, letting it mold to your feet as they naturally would be when barefoot. This way, the Copa Tango 18.1 already assists you on one of the most basic skills needed for playing soccer. Furthermore, the vamp cage called X-ray is crafted with embossed ridges. It’s made to help you with your kicks as it’s made with premium leather. It minimizes the risk of the ball slipping when it touches your shoes. It also optimizes control so you can be more sure of the ball’s direction every kick you make. This is the secret to make you look effortless while playing. The gum-rubber outsole are made specifically for indoors, so all the mentioned features will be best optimized and used on polished floors. It has very discreet studs that are almost invisible at first glance, but it’s there to be felt by the wearer as he or she becomes stable throughout the game. Beyond the built-in soccer features, the unisex sizes and appearance make it an attractive contender when it comes to soccer shoes. Apart from the leather material of the vamp, it’s also made with a variety of textiles, colors, and patterns. There’s a hint of tan from the sole, suede in front, a tonal three-stripe logo, and a black-and-white speckled textile for the tongue and back. These shoes are neutral without being too boring. It represents the good kind of minimalism as it makes up for the neutrality by way of textures and a coherent overall design. With proven stylistic and functional features, the Copa Tango 18.1 lends itself versatile for men and women alike who prioritize performance as well as style. 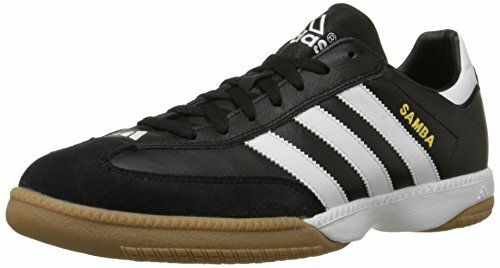 The adidas Performance Men’s Mundial Team Soccer Shoe is one of the top Adidas soccer shoes for indoors. First off, this one gets the vote as the top indoor soccer cleats because of the prominent uniform circular studs on the sole. There are six shoes to compare this with and even at first glance, the visible studs on these shoes look the most reliable in giving traction while running. 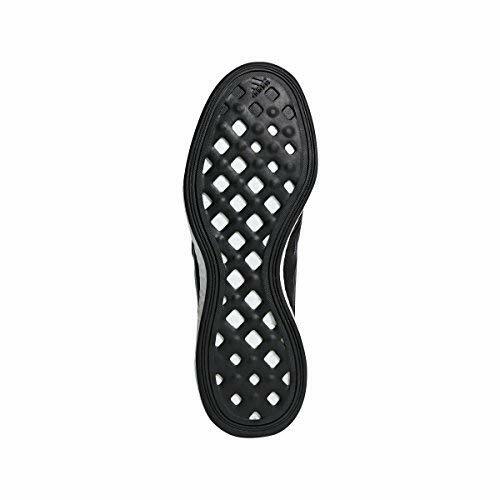 The gum-rubber outsole is also named Traxion. It’s probably a clever play on the word that describes its function best. The Mundial Team is second in Adidas’ naming convention that starts with Rookie. The Team model comes next and Pro and Elite models follow. This means this one is just right in the middle between rookie and pro models, which is good for more-than-amateurs but less-than-professionals. If the first one is available only for men and women, this model is accessible even to younger players who still qualify for youth soccer with US sizes that range from 4 to 10.5. This proves how this is fitting for players of any age and level. Despite being more universal in its market, these shoes are not any less focused in providing exemplary features. It started with the right cleats design, which gives a good grip to the ground, and it doesn’t end there. In terms of the outer composition, there’s some likeness between this and the previous Adidas pair. Both use leather and suede materials in the upper. However, in terms of outer appearance, they’re very different. This doesn’t promise a sock-like feel but it guarantees comfort in a different manner of its own. You could say the vamp is made with similar ridges but this time each layer isn’t a hard, firm surface. Rather it’s made with soft, grained, cushioned leather (similar to the look of puffer jackets) that absorbs and bounces upon touching the ball. This doubles the comfort from the outside while still being assistive for your performance in the game. The other half of comfort-giving features come from within. The synthetic lining and die-cut EVA foam insole and molded arched midsole cushion the feet from all angles. The interior of the shoes may feel slippery the first few times, as some customers have said, but the variety of sizes should allow you to pick one that will fit your feet the best. In time, you’ll get used to it eventually and know how to work the shoes. With soft and gentle materials inside and outside, breaking in these shoes isn’t going to be much of a struggle and wouldn’t cause as much pain. Compared to the 10.5 oz of the previous shoes – and the similar or heavier weight of the next ones – the 8.5 oz Mundial Team is on the lighter side of soccer shoes. Durability isn’t a questionable matter either. These turf shoes are just as useful on indoor floors as they are on artificial or natural grass. The sole’s studs prevent slippage on the former while it encourages ease of running on the latter – a win-win situation either way. You could say it’s the best indoor soccer cleat. Some customers even say that these are strong enough to endure different kinds of weather. We all can relate to the struggle of wanting to protect our shoes in both wet and dry conditions. These shoes eliminate that problem, especially when you don’t get to choose where you play every time – whether indoors or outdoors. It also employs a classic Adidas design with the three stripes on the sides and the logo heel counter, both in contrasting white colors against the black background. A nostalgic yet timeless look for every Adidas loyalist. It’s a bit pricier. In fact, it’s the most expensive one in this list, but for its features that exemplify quality and its aesthetic that epitomizes Adidas’ signature, the Mundial Team proves to be worth every penny. Like any other sport, soccer is born out of leisure. Players start with it as a hobby and some never lose that passion to play for fun without the desire to go into the big leagues. If you’re more of a casual player, the adidas Performance Men’s Samba Millennium Indoor Soccer Cleat comes as a fashionable yet durable option. If only for a few features and capabilities, it’s almost the same as the Mundial Team but for much cheaper than the the previous one. It saves you a few bucks for these same features: molded arch support through the midsole, synthetic material of the lining and exterior, EVA foam insole, gum-rubber outsole, and a combination of grained leather and suede for texture. Since it’s mostly the same on the inside, the break-in period would probably take just as much amount of time as the Mundial Team would before becoming fully comfortable. On the bright side, this would just encourage you to practice more because the more times you use it, the more you’ll be used to the feel of it on your feet and how to use it while playing. Over time, it will get more and more comfortable, and the sturdier structure mirrored from the Mundial Team will ensure you actually reach a time when you could rely on these even out of practice time. Maybe for scored games with your friends? The previous Adidas shoes’ main specialty was the traction it could support you with on any surface. This model could also promise the same thing, but more for the indoors as these shoes do away with the studs on the sole. Sans the studded outsole, the Samba Millennium now looks more casual and fitting for sporty outfits, which has recently reached status in the fashion industry as an acceptable day-out aesthetic. Add to that the attractive combination of neutral colors, these shoes give a twist to the classic Samba. One notable difference is a shorter tongue. Despite the loss of the studs on the outsole, this promises a good grip on indoor surfaces. The non-marking gum-rubber sole makes sure of that. Of course, it can’t be all positive and perfect. This one has a fair share of disadvantages. First off is the weight. Opposite to the Mundial Team, this one is on the heavier side at 12.4 oz. It even weighs more than the Copa Tango. The firmer upper, which customers say have a padded feel to it, may also hinder you to connect with and feel the ball better. These are not without a solution because, as mentioned, these shoes prove to get better with age. Heavier weight in soccer shoes might have a specific purpose of increasing your stability. The latter, though, is something to push you to do better with your performance. These are just some things you might want to consider beforehand and be willing to face once you actually get a pair. These shoes come in male sizes but they can fit females too. Out of all the shoes in this list, this has the widest range of sizes from US 4 to 13.5. For that, the similarities with the trusty Mundial Team, the cheaper price tag, and the casual looks, the Samba Millennium is agreed to be the best overall shoes for indoor soccer. Even fashion insiders would green light these shoes to match with anything in a sport or streetwear-inspired wardrobe. As a standard, the Copa Tango 18.1, Performance Mundial Team, and Performance Samba Millennium are also our top 3 picks. They are what we’d consider the standard for indoor soccer shoes. Each has an added bonus of their own, are fashion industry-approved, and compatible with soccer players of different levels and ages. However, if you have to vote for the top indoor soccer shoe among the three, it should probably go to the Samba Millennium. A diversion from the more universal models, the KELME STAR 360 Indoor Soccer Shoes offers a different set of features for a specific kind of a soccer game. Made specifically for futsal, a variation of indoor soccer, it’s the best pair of futsal shoes in this selection. If you’re looking into futsal shoes, you won’t be surprised at the sudden change of outward appearance. From the casual-looking Adidas options, this one looks every bit like what you’d expect an indoor soccer shoe to look like. Could you expect anything less from a product of Kelme and Michelin’s collaboration? Kelme is a Spanish sports brand that produces sports gear including footwear. Michelin, on the other hand, is a well-known brand trusted for their rubber products like tires. Both have their own expertise – Kelme for sports shoemaking and Michelin for durable and flexible rubber. Together, the result got futsal players floored and is a favorite for them. On the outside, you’ll see a mix of different materials used: synthetic, suede, leather, and mesh. Each follow a color-blocking pattern throughout the shoes. The abundance of materials in the upper makes them stiffer during the initial times of wear. It takes some time to feel comfortable, but has advantages to it when broken in. The indoor shoes are crafted to be tighter at the front and goes wider towards the center and heel. The purpose of this is to allow the shoe to mold itself to your feet as you use it. No two pairs of these shoes are intended to be the same for everybody. In a way, it forces you to use it and practice, so both you and the shoes can improve in performance. After the break-in period, the shoes should feel like they were custom-made exactly for your feet. This means a more personalized play enabled by the familiarity of the shoes. In terms of the fit, this one generally runs bigger. You might want to order one or two sizes smaller for these shoes. The available ones range from 6 to 13.5 according to US standard sizes. It covers the usual average sizes for male players, who these shoes are catered to. 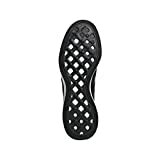 Nevertheless, the interior of the heel is lined with a padded mesh material while the EVA insole provides a cushion, both securing your feet in place. On the outside, the star-patterned sole is made of gum-rubber that has a solid feel for the feet. It’s a bit thin which makes you feel lower and more connected to the ground. At the same time, it boasts of its strong grip as the other soccer shoes have. This is helpful when you have a smaller field to work with, which is the case for futsal games. For the same reason, what makes futsal shoes great is the ball touch. It would turn out that the many materials used for the upper each has a purpose for an accurate touch and connection to the ball. The leather has a slightly padded feel that is soft to the feet but sure with the ball touch. There are also suede materials in the instep and toe which serves as a gripping material for added support. Futsal is just one of the many variations of soccer, but it’s not any less than the popular sport. For what it’s intended as, the Star 360 delivers on the functionality required for futsal games, mainly in the materials and their well-thought-out construction. 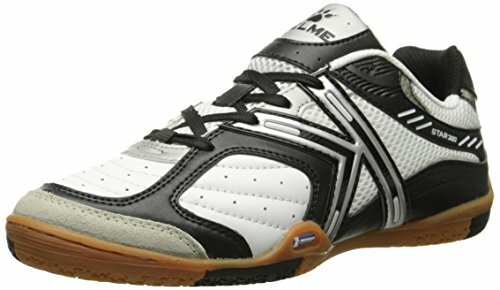 Overall, if you’re looking for the best futsal shoes, this pair from Kelme is the way to go when playing indoor soccer. So far there’s already been three Adidas pairs in this list, with one more coming in last, but we’re not about to disregard Nike fans out there. We know all about the Adidas vs. Nike debate going on for more years than we can count. We know sometimes choosing shoes is not about the model, it’s about the brand. With that, we share the best we’ve found from Nike: Mercurial X Victory VI Dynamic Fit CR7 IC Indoor Soccer Shoes. If there’s anything we can compare this to, it’s the sock-like fit of the Copa Tango 18.1. For this Nike shoes, though, it’s not just sock-like because where the usual opening of the shoes is, there’s a ribbed knit-like fabric like an actual sock that hugs around your ankles. This composition allows the shoes to lose the tongue, but not the snug fit. The textile feature even enhances it through ankle support which isn’t present in other shoes. Simultaneously, it helps along the laces that can be tightened to your liking. You won’t find many lengthy reviews about these shoes, but one common sentiment from the few that regarded these shoes with high ratings is that it does exactly what it says it would do. What’s that exactly, you ask? Well, the first thing is the good grip of the studded gum-rubber outsole. It provides a strong traction against turf surfaces or artificial grass, making it one of the best artificial turf soccer shoe choices. However, it’s not limited to that. Some would say this one is also good to use on natural grass, street, or court grounds. This is more like Kelme and Michelin’s Star 360 than the Adidas shoes before that. The sole is thinner, therefore you’re closer to the ground. The upper, though, is made simply with synthetic material crafted with parallel horizontal ridges. It allows a great connection between the ball and your foot. Embossed ridges for enhanced touch. Dynamic Fit collar for support around the ankle. In terms of what’s inside, the Victory VI model contains the same EVA insole and molded arch. 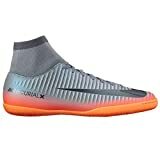 It might not be as cushioned as other Mercurial models, but compared to the other shoes in this list, it has almost the same offering in the interior aspect. Weighing only 8 oz flat, this Nike Mercurial is the lightest soccer shoe among this selection. As an effect, it could boost your agility and speed without the extra weight that might hold you down and then carry with every step. These shoes doesn’t use that many materials like the previous models. The same can be said about the way it’s constructed. It’s as simple as a sock boot could get. It doesn’t employ too many complicated design tricks, but if laid side by side with the Adidas and Kelme shoes, this one could compete with the same level of beautiful aesthetics. It has an ombre effect that starts with white on the toes and transitions in a gradient to pink towards the heel. Of course, the iconic Swoosh logo can’t go missing and it’s hard to miss as it is prominent on the vamp and cuts through the ridges on the side. Even with a color that might be commonly considered more feminine, these shoes are marketed to male soccer players. Anyway, the shade of pink is an attractive one that’s as bright as the other color options in other shoes. One commendable thing customers have also noticed and praised is that the shoes are true to size. It fits exactly what your normal would be. Men with smaller feet, however, might do better with the previous models because this one only offers US sizes of 9.5 to 12.5. Don’t get discouraged by the dominance of Adidas shoes in this list. They’re only numbers. If you ask us, the Nike MercurialX Victory VI DF IC could satisfy amateur, casual, and professional soccer players at once. This is the best Nike indoor soccer shoes not because it’s the only Nike model in this list, but because it holds up its own reputation as such too. As we’ve mentioned, the brand may affect what shoes you get. Some would rely on the features or the model, especially collectors. For the remaining some, the prevailing factor for choosing shoes might be the price. With that, we’ve got the best cheap indoor soccer shoes for those who are running low on budget. The thing about the word cheap is that it’s often synonymous with low quality. 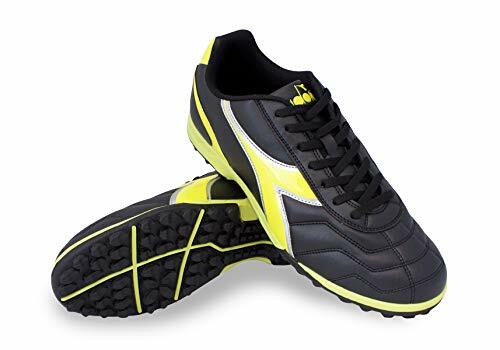 People are right to doubt and be skeptical, but with this Diadora Men’s Capitano TF Turf Soccer Shoes, it’s just not worth the worry. It’s in this list of best turf soccer cleats, right? If you can’t take our word for it, the shoes have amazing qualities that will prove its worth to have a spot in this list. By now you’re probably used to the ridged feature of the upper in soccer shoes, having seen it in Adidas’ Copa Tango 18.1 and Mundial Team, and Nike’s MercurialX Victory VI DF IC. Diadora’s Capitano Turf also uses this design feature for the same reason that it gives a good touch to the ball when playing. Out of the three previous outer appearances of the ridges feature, Diadora’s shoes resemble that of Mundial Team’s the most. It’s also made of soft padded leather that’s gentle on the foot but accurate for the ball. The rest of the shoe is made with the same leather-like material and is designed with a minimal pattern that’s made exciting by the pop of neon yellow. The outsole is where the Diadora differs from the others. They have gum-rubber outsoles but this one uses synthetic material. However, it doesn’t affect the performance of the shoes or its ability to support you. When it comes to the outsole, this one even has bladed and cone-like cleats that allow you to play even during some bad weather conditions. This is because aside from being good in indoor fields, the Capitano Turf can also be used in outdoor artificial and natural grass. This is perfect for youth soccer players who might be game whatever kind of weather or setting is available to them. That said, adult men and women alike can also have a Capitano Turf fit their feet. The shoes have a wide range when it comes to the people it caters to. According to some reviewers who’ve given a generous rating of this model, these are high quality for the value they’re equated to. Some even commented on the comfortability of the shoes. That’s probably for the same cotton and shock-absorbing EVA insole and midsole as the others have and boast of. Even if this Diadora shoes could keep pace with the more expensive models in this list, it still comes with its own set of consequences. Cheaper may not automatically mean lower quality, but you have to be ready to make a compromise on some aspects. With the Capitano Turf, it’s taking extra care of the shoes to extend its lifetime. Durability isn’t its strongest suit. It’s only little things you have to do like drying the shoes completely after every use. Even some hint of dampness can weaken the construction of the synthetic outsole. If you’re forgetful of micro tasks like that or are simply not patient enough, this might not last you long enough. However it’s a small price to pay for the amount you’ll save and almost the same quality you’ll get. Before fully committing to this model, one thing to consider is that it weighs 14.1 oz. It’s on the heavier side of soccer shoes and this is the heaviest in this list. With all this to consider, the Capitano Turf still has more positive qualities than negative ones. As the positive feedbacks show, this is worthy of its place as one of the best soccer shoes for indoors. Whether you’re a fan of him or not, it’s safe to say that Lionel Messi is a beast on the field. Every recognition of the widely-known Argentine player has been well-deserved. For fans of Messi or soccer itself, this Adidas model named after him is extremely tempting. We can see it becoming a collector’s item if it ever stops production, which seems unlikely. Fans and critics of the laudable player only make him more of a superstar athlete than he already is. The Adidas Men’s Messi 16.3 TF Soccer Shoe is no different; it’s a superstar in its own right. There are many versions of the Messi soccer shoes. This one in particular has similar materials and overall quality as the others but has its own stylistic details. If we’re starting off with the outer appearance, this one can pass professional standards and fit in with underground and low-key players. The neon green panel on the bottom part of the shoes including the sole make it pop from afar without being too showy. At the same time, the way it’s colored in and transitioned to the black color of the upper part takes the effect of a spray paint on a solid wall. The gradient effect of the green makes it look effortless and nonchalant in design but little details like the subtle, almost-invisible specks of neon green throughout the shoes aim to impress. There’s also another little detail that holds more purpose than just aesthetic. From the vamp all the way to the heel counter, there’s a little polygonal-patterned synthetic covering the textile material that makes up the shoes. Aside from giving texture to the look of the shoes, it’s what gives you advantage when kicking the ball. There’s a little bit of grip once they touch that enables you to direct where it’s going. The same polygonal pattern graces the cleats of the bottom sole. Just like for the ball, it does the same function of providing traction with the ground. Even the outsole is named after Messi, which the brand markets as recommendable for indoor surfaces. It enhances skills the player often demonstrates on the field: agility and speed. When it comes to the interior, these shoes are like the epitome what it means to be comfortable. This uses the same EVA foam insole and delivers arched support, but for almost all the others in this list, you have to consider the break-in period. You won’t know exactly how it’s supposed to feel on the first time. You have to wear it a few more times and if you’re lucky, it will be the best fit for your feet. The Performance Messi 16.3, however, is equipped with what Adidas calls the Agility Touch Skin. This feature allows for the shoe to mold instantly to your feet the first time you try it. No breaking them in whatsoever! That alone is a winner! With this, you won’t have to wait in anticipation and worry whether the shoes will make or break your performance. Right then and there, the fit will tell you if it feels good or not. The mono-tongue also keeps it tight on your foot. It poses no risk of slippage of your feet within the shoes while sturdy laces hold them down and in place the whole time. The 10.2 oz Messi 16.3 falls on the average weight of soccer shoes. It’s similar to what you’ll find in most soccer shoes of its kind in the market, except it’s also made in consideration of those with wide feet. Out of all the shoes in this list, this is the best indoor soccer shoes for wide feet. The price point is also fairly reasonable. Actually, it’s even a little bit generous considering this model is named after one of the most highly-regarded soccer players of our time. You’ll know a good shoe when you see one and this will almost surely make the cut. A fan or not, every soccer enthusiast can appreciate these durable Messi shoes. It’s easy to get lost in the jargon of indoor soccer shoes, much more when other types of shoes are inserted into the conversation. To clear out confusion, we attempt to answer frequently asked questions so your hunt for the top soccer indoor shoes end with the pair that’s right for you. What defines an indoor soccer shoe? Indoor soccer shoes, especially the leading models in the market, are defined by its low-cut profile, heavier weight than normal sneaks, and quite often but not always, a suede panel on the upper or exposed stitches at the toe. Their gum-rubber outsoles either feature cleats or are flat. Under which you’ll find a turning disk in the middle, and a dip in the heel tread. For some, laces are exposed but many models have them hidden underneath an extended tongue. Several styles of indoor soccer shoes have been invented but their function remains the same for all: to be worn in turf or court indoor fields. Their protective features apply both externally and internally for the player’s feet and the floor surfaces they play on. Why wear indoor soccer shoes? The game itself requires sudden maneuvers and pivots. Indoor soccer shoes, whether with cleats or none, are designed with a different tread pattern on the outsole. It enhances the player’s abilities to perform those skills whereas regular running shoes wouldn’t cut it. In terms of playing itself, indoor soccer shoes provide a better ball touch which lets you have plenty of control. Other than their beneficial qualities, indoor soccer shoes adhere to the requirements of indoor soccer facilities where other kinds of shoes may damage the playing field. How does it differ from an indoor futsal shoe? There’s very little difference between indoor soccer shoes and futsal shoes. Futsal is played in a hard court, which also has smaller dimensions. It follows that futsal players get more contact with the ball more than they run around. For this reason, futsal shoes tend to focus more on features that improve ball touch. It’s important to note this difference if that’s what you’re specifically looking for. If it’s the quality most relevant to your playing style, futsal shoes may be the best turf soccer shoes. However, in general, futsal shoes and indoor soccer shoes may look alike on the outside and can be used alternately. How does it differ from a soccer cleat? Firm ground soccer cleats are the classic type of soccer shoes. They’re usually made with non-removable, sharper, and cone-like studs that can penetrate soil, thus used for outdoor soccer played on natural grass. Sometimes, the cleats are even made with metal to solidify its strength and durability. Indoor soccer cleats are much more casual in appearance. They can even be paired with normal day clothes, as with running shoes. Internally, indoor soccer cleats have less cushioning, therefore less comfortable feel, so players tend to wear them with gel shoe inserts. Can I wear my soccer cleat for indoor soccer? In consideration of indoor fields, it’s not advisable to wear regular soccer cleats for indoor soccer. The artificial turf or court will most likely not survive under the force and harsh markings of the studs, especially those that aren’t made with rubber and are conical in shape. It is probably only permissible to wear soccer cleats for indoor soccer in the special occasion that the game will be played outdoors on natural grass. Can I wear my indoor soccer shoes outdoors? Even though indoor soccer shoes function differently to running shoes inside the field, they have the same appeal as the latter outdoors. These type of shoes could easily pass for fashionable sneakers that can be matched with casual outfits. Can I use running shoes or cross trainers instead? Just by looking into the listed features above, it’ll be obvious that running shoes and cross trainers don’t possess the recommended qualities for grip, fit, and overall construction. The best soccer turf shoes are made up of specific and specialized features for convenience to the player and protection of the artificial turf. In the literal sense, you can wear running shoes and cross trainers, but if you’re intent on playing your best performance, these are non-negotiable features. There’s so much to be read about indoor soccer shoes, which can be overwhelming when you just want to pick a specific model that won’t fail you. From definitions to features to actual shoe recommendations, this comprehensive guide walks you through what’s hottest and latest in the indoor soccer shoe market. Bookmark now for a much-needed reference!